Except in the early years of last century, French motorcycle manufacturers have made little impression on the international racing scene. Nevertheless, that hasn't prevented the country's many small workshops from continuing to build grand prix racers. Among the most outstanding were the bikes produced by the Nougier brothers at Saint Andiol, near Avignon in Provence. Nougiers were built from stem to stern by Jean Nougier but this old-fashioned approach gave away nothing in terms of sophistication to the machines built by the great makers from other countries. 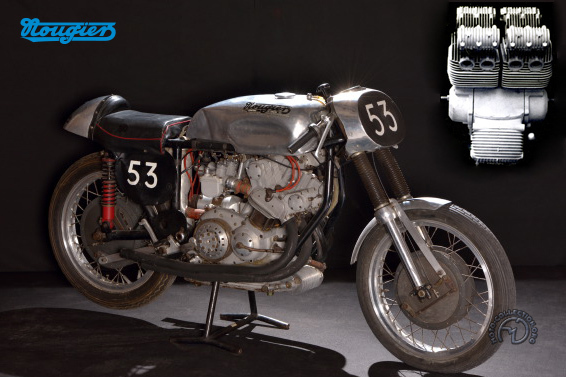 Already well-known for his twin-cam singles based on Terrot / Magnat-Debon machines and his 250 twin , Jean decided to challenge the all-powerful Gilera and MV Agusta bikes on their home ground. In 1953, he built a four-cylinder. With the aid of the metal founder Pierre Collignon, he made all the components for this remarkable machine, the sole French four-cylinder built in the postwar era, apart from Citroen-engined BFGs of the Eighties. Superbly finished and technologically formidable, the Nougier seemed to have everything going for it. But the Nougier brothers lacked the financial muscle to develop it or to employ a top-drawer rider capable of putting it in the winner's circle. Norton try to buy the project but finally gave up. The results this amazing bike achieved never show its real potential. The Nougier engine was remarkably narrow, thanks to a primary drive by gears cut directly into the crankshaft, and the dring pinions behind and not in between the cylinders. To keep it narrow, there is just tbree float chambers for the quadruple carburetors.